Introduction: Craig Kuglen shares this interesting information about his great great grandfather, Richard Williamson, and his grandfather, Stewart Craig, in a story spanning almost 150 years. Craig Kuglen’s great great grandfather, Richard Williamson, was an engineer on one of the Royal Navy ships involved in laying the transatlantic cable in 1858, serving as Assistant Engineer on HMS Valorous in the cable fleet. By 1861 he was Chief Engineer of the Valorous, and later had the rank of Commodore. After the successful laying of the cable, Tiffany and Company in New York sold sections of the remaining cable as souvenirs. 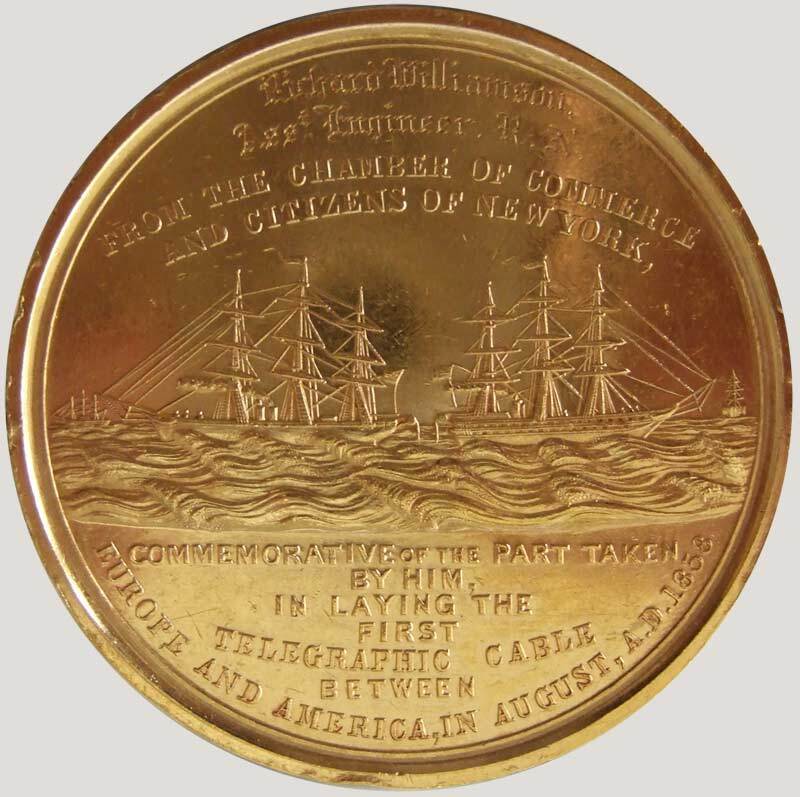 By order of the Chamber of Commerce of New York, Tiffany also made commemorative medals in gold, which were engraved with the names of the participants in the cable expedition on the Niagara, Agamemnon, Gorgon and Valorous, and presented to them. Two sizes and weights of medal were made, both in the purest gold; nine of 2¾" diameter weighing five ounces were presented to the expedition’s principals, and fifty-seven medals of about 2¼" diameter, weighing three ounces, were given to the other crew and staff of the cable ships. See below for details of the medals and a lists of recipients, as published in Frank Leslie’s Illustrated Newspaper for July 9th 1859 and the Annual Report of the Chamber of Commerce of the State of New-York for the Year 1859-60. Additional medals of the smaller size were struck by Tiffany in bronze and sold to the public as souvenirs. 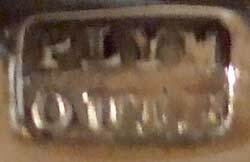 On the reverse is engraved "Richard Williamson, Asst. Engineer. R.N." 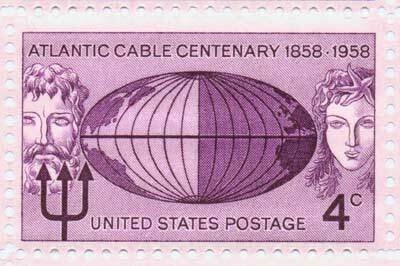 Telegraphic Cable Between Europe and America, in August, AD 1858." The medal came to Stewart Craig, Richard Williamson’s grandson, in 1910, and he loaned it out for display on several occasions. "Mr. Mackay has returned from his holiday and has seen the medal which was presented to your grandfather and which you so kindly offered to lend us for window display purposes. Mr. Mackay is very much pleased with the offer and directs me to thank you for it." Clarence Mackay was President of the Commercial Cable Company, headquartered at 231 Broadway, New York. "Please accept our thanks for your courtesy in lending us this interesting souvenir of the laying of the first Atlantic cable. It greatly enhanced our display of the cable and was of much interest to many of the Fair visitors." 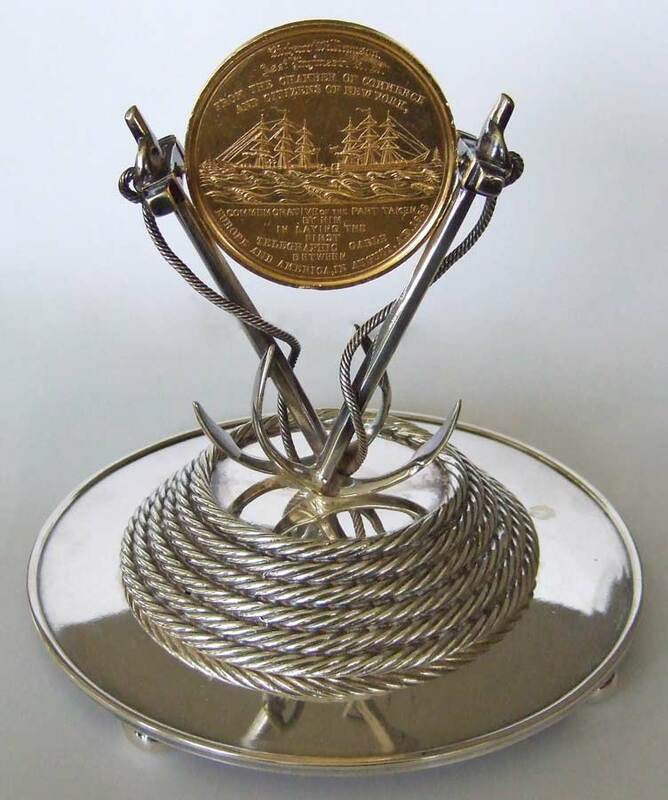 The silverplate stand for the medal, made for its showing at the 1939 World’s Fair, is marked "T. Ellis" "Plymouth"
All America also purchased a quantity of the left over 1858 Tiffany cable souvenirs for the company's World's Fair celebrations. 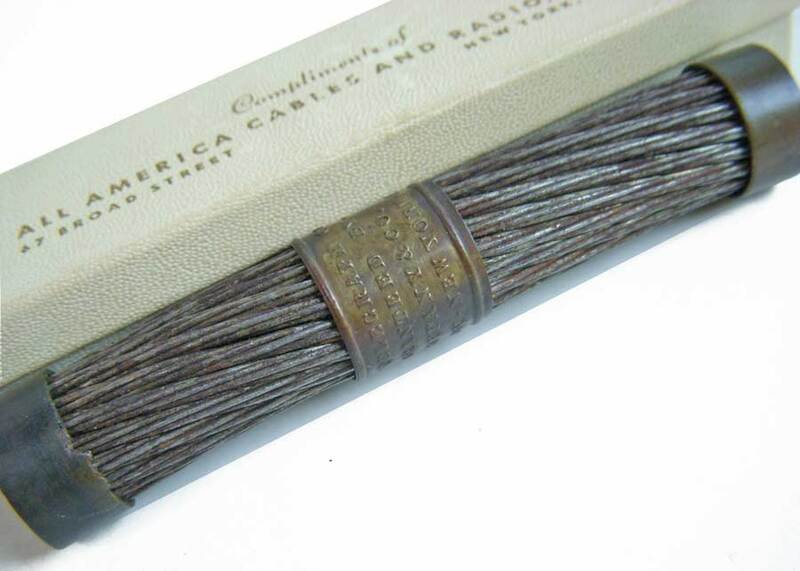 Each piece of cable was presented in a special box, accompanied by a reproduction of Cyrus Field's 1858 letter of authentication to Tiffany & Co.
67 Broad Street New York N.Y. In 1957, the year prior to the hundredth anniversary of the first cable, Stewart Craig was active in campaigning for a commemorative stamp to mark the event, to be issued in 1958 on the anniversary of the cable’s completion. After correspondence with his Congressman, William B. Widnall (a member of the Banking and Currency Committee), he was referred to the Post Office Department, and the stamp was duly issued on 15 August 1958. As part of the First Day of Issue Ceremony for the stamp, Richard Williamson’s gold medal was highlighted in a lobby display at the General Post Office, 33rd Street and 8th Avenue in Manhattan. Stewart Craig and his wife were invited to the ceremony, where they received the souvenir program and a sheet of Atlantic Cable stamps autographed by Postmaster General Arthur E. Summerfield. General view of the First Day of Issue Ceremony, 15 August 1958. 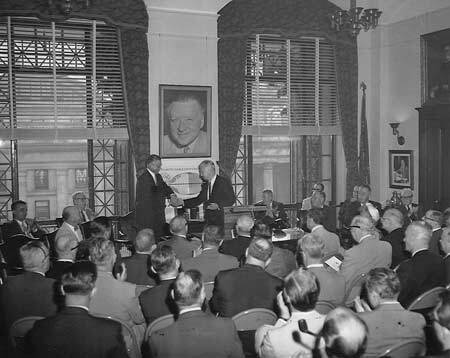 Robert K. Christenberry (Acting Postmaster) accepting album commerating cable stamp from Hon. L. Rohe Walter (Special Assistant to the Postmaster General, Public Relations). the Post Office building in New York. its stand in the display case at the right. 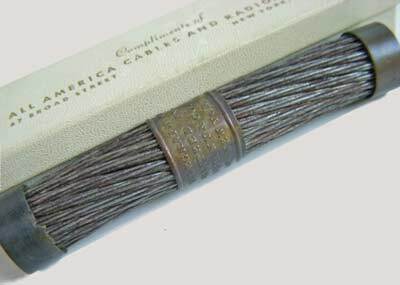 Richard Williamson’s cable sample and gold medal have remained in his family for over 150 years, and are presently in the care of his great-great-grandson, Craig Kuglen. Presented by the New York Chamber of Commerce. 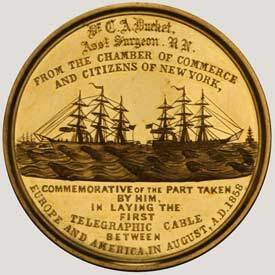 The medals made by Tiffany & Co. to the order of the New York Chamber of Commerce, in commemoration of the laying of the first Atlantic cable, are of two sizes, there being nine of the first class and about fifty of the second class. The material of all is gold of the purest character. The large medal weighs five ounces, and is two and three quarter inches in diameter, and one-eighth of an inch in thickness, including a slight projection of the rim. 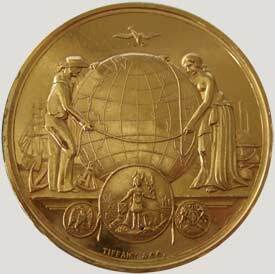 This medal, to be presented to those who were especially instrumental in the designing and fostering of the enterprise, bears upon its obverse face in ordinary bas relief a representation of the globe, supported by Columbia and Britannia, and surmounted by a delicately executed figure of Peace, whose extended arms are presenting to each national genius an olive crown. Columbia is an Indian girl, bearing a well filled quiver upon her back, on her head a feathery crown — the diadem of an aboriginal queen - in her left hand an olive branch, and in her right grasping an end of the cable, which, after surrounding the globe, is held in a similar manner by Britannia. The genius of Great Britain is a classical conception, leaning upon the globe, with her face turned towards her western sister. At the side of Columbia is placed an eagle, and at the side of Britannia a lion. Below the artist has sculptured the seal of the Chamber of Commerce, supported by the arms of the United States and Great Britain. Upon the reverse face of the medal the artist has achieved a triumph in the admirable representation of the joining of the cable in mid ocean. In the foreground are excellent delineations of the Niagara and Agamemnon, while the Gorgon and Valorous are to be seen in the distance. Below and above the sculpture the words of presentation are inscribed in raised letters upon the burnished plain surface. The smaller medal weighs three ounces, and is two and a half inches in diameter. The obverse side bears — as in the larger medal — a globe, but in this instance the sphere is supported by figures of Science and Navigation, the design of the presentation contemplating rather a commemoration of the part which professional skill and fortitude contributed to the execution of the project, than of the design and organization of the project itself. A dove hovers over the globe, bearing an olive branch in her beak. Navigation is symbolized by a background sculptured with ships, anchors and sextant; and Science has a similarly appropriate surrounding. As in the larger medal, the seal of the Chamber of Commerce, between the arms of the two countries, is to be seen below. 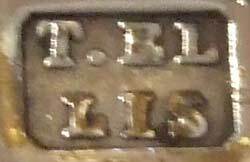 The reverse side is in all respects identical with that on the larger medal. As specimens of the medallist’s art, Tiffany & Co., in the execution of this order for the Chamber of Commerce, have furnished works that, in design and finish, by far excel anything produced on this side the water. The larger medal, especially admirable for execution, is a specimen of the art than which the most lavish order could not demand a finer workmanship, nor the highest taste a more happy design. The following are the names of the recipients of the medals. Captain William L. Hudson, U.S.N; Captain George W. Preedy, R.N. ; Captain W.C. Aldham, R.N. ; Commander Joseph Dayman, R.N. ; Cyrus W. Field; William E. Everett U.S.N. ; Lieutenant Otredy H. Berryman, U.S.N. ; William Henry Woodhouse, C.E. ; Captain Henry C. Otter, R.N. U.S.S. Niagara - Lieutenant James H. North; Lieutenant Joshua D. Todd; Lieutenant John Guest; Lieutenant William A. Webb; Lieutenant Edward Y. McCauley; Lieutenant Bancroft Gherardi; Surgeon Dr. Daniel S. Green; Lieutenant of Marines William Stokes Boyd; Purser Joseph C. Eldridge; Chief Engineer Joshua Follansbee; Chief Engineer John Feron; First Assistant Engineer William S. Stamm, Second Assistant Engineer George R. Johnson; Second Assistant Engineer Mortimer Kellogg; Third Assistant Engineer Jackson McElmell; Third Assistant Engineer George F. Kurz; Third Assistant Engineer William G. Buehler; Third Assistant Engineer Joseph Bailey. H.B.M.S. Gorgon – Lieut. John B. Butler; Lieut. 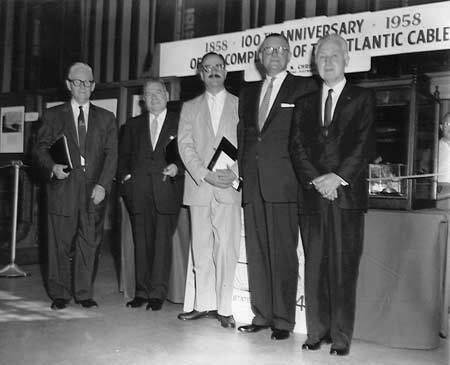 John B. Michell; Christopher Albert, Master; Surgeon Hart Gimlett; Paymaster Albert P.M. Roberts; Chief Engineer Robert E. Home. H.B.M.S. Agamemnon — Lieut. Hon. F. O’B. Fitzmaurice; Lieut. Robert Gibson; Lieut. Elibank H. Murray; Lieut. Frederick C.B. Robinson; Master Henry A. Moriarty; First Lieut. Royal Marines U.L. Morris; Surgeon William D. Kerr; Paymaster James B Moorman; Chief Engineer James Brown; Chief Engineer Benjamin Hoare; First Assistant Engineer Charles Moore; First Assistant Engineer John Brown; First Assistant Engineer Samuel Clements; First Assistant Engineer William Smiley; First Assistant Engineer William B. Harvey; Second Assistant Engineer John Hefferman; Second Assistant Engineer Edwin Pearce. H.B.M.S. Valorous — Lieut. Richard Moore; Lieut. Gilbert T. Key; Lieut. Hon. J.T. Fitzmaurice; Lieut. Howard Kerr; Master Samuel Braddon; Assistant Engineer Richard Williamson; Assistant Engineer William Farquharson. The list in Leslie’s, while comprehensive, is not complete. See below for the official report from the Chamber of Commerce. Cyrus W. Field (medal at the Metropolitan Museum of Art, New York, gift of Cyrus W. Field, 1892 [92.10.3]). A copy of Field’s medal “imprinted in red wax” is at the Bibliothèque Nationale de France, Département des Monnaies, Médailles, et Antiques, Paris. William G. Buehler, USN, 3rd Assistant Engineer, USS Niagara (medal sold by Early American Auctions, 2003). Dr. C.A. Ducket, RN, Assistant Surgeon, H.B.M.S. Agamemnon (medal in Alan Weinberg’s collection). Colpoys P. Hearslop, 1st Lieut. Royal Marines, H.B.M.S. Valorous (medal sold by Spink America, 1995). John B. Mitchell, RN, H.B.M.S. Gorgon (medal at National Maritime Museum, London). 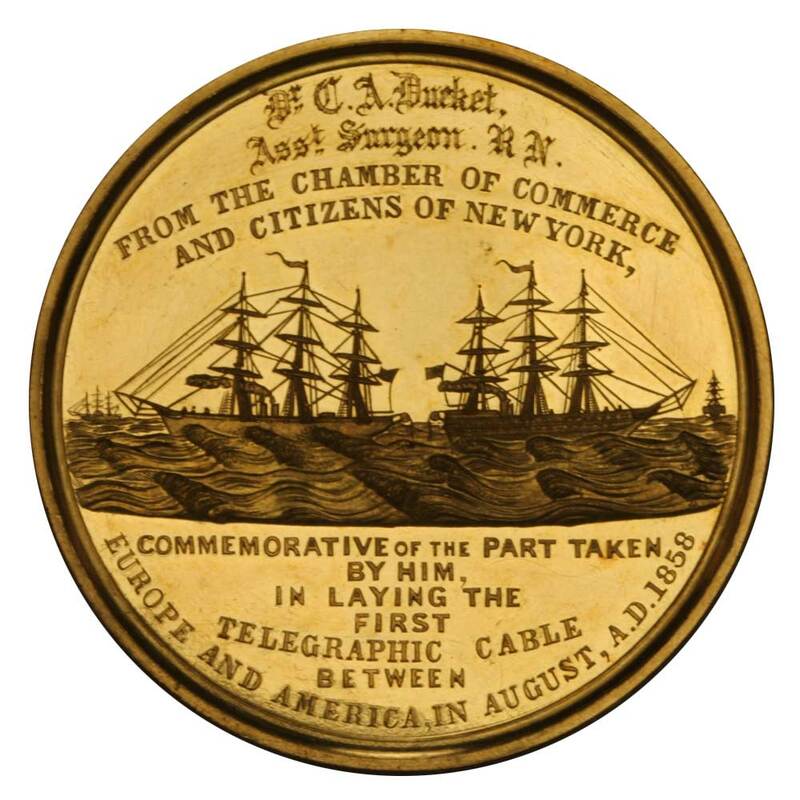 The Annual Report of the Corporation of the Chamber of Commerce of the State of New York: for the year 1859-60 had the following details of the medals. The number of medals in each section is indicated; these total 9 First Class medals and 57 Second Class medals. This list includes the names not in the Leslie’s report above. Cyrus W. Field Captain William L. Hudson, U.S.N. Monthly Meeting, Thursday, August 4, 1859.—Mr. P. Perit, President, in the Chair. Mr. E. Hincken, chairman of the sub-committee, to whom had been confided the contract for first and second class gold medals, to be awarded to officers and others engaged in laying the Atlantic telegraph cable, reported verbally that the medals were now ready for delivery to the Chamber by Messrs. Tiffany & Co.
Whereupon it was resolved that the committee on medals be, and are hereby authorized to distribute the medals severally to the proper parties. Monthly Meeting, Thursday, November 8, 1859.—Mr. P. Perit, President, in the Chair. A letter from the Hon. 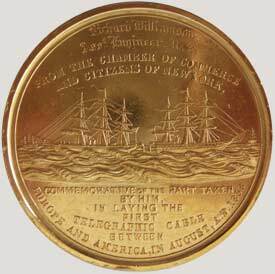 George M. Dallas, Minister from the United States to the Court of St. James, was read, acknowledging the receipt of forty-one gold medals, awarded by the Chamber of Commerce and citizens of New-York to the British officers engaged in laying the Atlantic telegraphic cable in the year 1858.